When Chuck Townsend and his son Justin head out on a cruise to Mexico in 2016, they are both at a turning point in their lives. Chuck is recently unemployed and Justin has dropped out of college. Both are looking for a new direction in their lives and they find it when they attend a lecture by Professor Bell. Soon they find themselves on an adventure of a lifetime as they travel back in time to 1900. 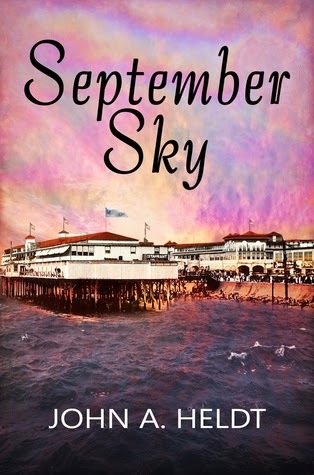 September Sky by John A. Heldt is a fun, romance-filled time travel novel that follows Chuck and Justin as they experience America of 1900. They spend most of their time trying to save an ancestor from a death sentence for a murder they think he may not have committed. During their travels, they meet many people and learn to acclimate to the culture of the time. They also work on their own relationship and try to figure out what they each want out of the future. The historical aspects of the story are interesting, particularly the details about the massive hurricane that hit Galveston, Texas, at that time. I also enjoyed the strong women in the story, although I'm sure they weren't as common as they seem in the novel. But I honestly got a bit annoyed by the main characters. Professor Bell gives them specific instructions for their trip and it was frustrating that Chuck and Justin pretty much ignored everything he told them. I did like the suspense related to the murder and the impending hurricane, but I found some of the outcomes a bit too predictable. In the end, I found that I enjoyed Heldt's Northwest Passage novels more than September Sky. But it is a decent time travel story that sets up a new series, American Journey, that I will likely continue to read. September Sky is currently available for just 99 cents on Amazon! This review was written based on a copy of September Sky that was provided by the author in exchange for an honest review.